The Dark Side of a Mini Addict: Yep I went there and in pink to boot! If you ever saw my closet you would think I was hoarding the Adams familys clothes. ;) all black grey etc, but I do have this one sweat suit I wear " vibrant neon pink"
Hi! I just joined your blog. Sorry, I don't have one of my own. 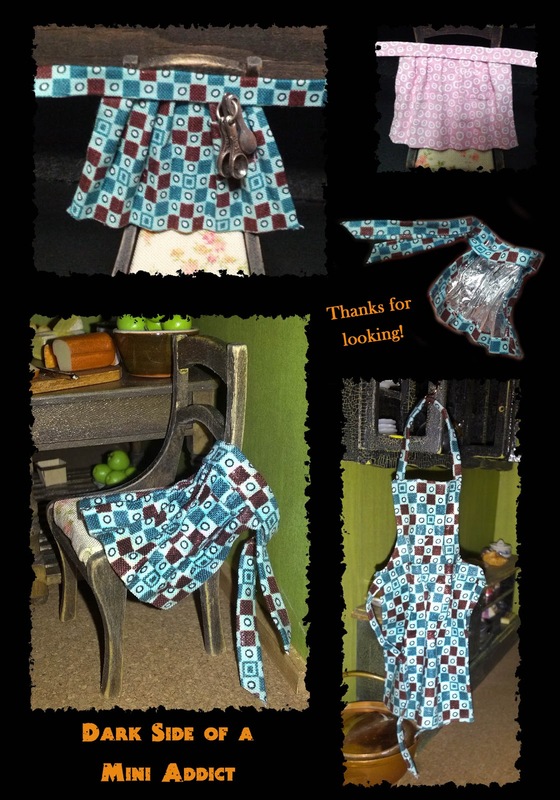 Your aprons are so cute. Personally, I use aprons that tie around the neck because they give more protection especially when I'm wearing something nice. I can't look at your whole blog but I had a look at your chairs. I love the finish on them. I'll be back to have a look around and see what you have done from the beginning. I like both types. I think they must have different functions. As I remember it, the one who tied on the waist is for the housewife and the one to the neck is for the cook. I have both types, but has inherited the waist from my mother. I do have a Wednesday's dress somewhere from when we have a local theatre and every Halloween they had a huge costume contest and showed Rocky Horror with full audience participation. My friends and I all went as the Adams family. My closet runs inn the fall colors all dark reds, oranges, greens and of course grey and black. Although. I too have a pink hoodie. Thanks for following my blog Lucille. I agree on the around the neck apron because cooking does get a little splashy and it does help. I did not know that and that makes sense too about the different types. I bet that inherited apron from your mom brings back great memories. They are adorable! The measuring spoons hanging on there is so fantastic! !